Supermodel Nykhor Paul, The 25-year-old South Sudanese beauty, who has walked in shows such as Vivienne Westwood, Balenciaga and Rick Owens, took to Instagram on Monday to post a heated rant aimed at makeup artists who are unequipped to work with women of color while highlighting the lack of diversity in the fashion industry. "Dear white people in the fashion world! Please don't take this the wrong way but it's time you people get your s--t right when it comes to our complexion!" the model began. "Why do I have to bring my own makeup to a professional show when all the other white girls don't have to do anything but show up wtf!" She continued, noting that there are a number of makeup brands that cater towards black women, so there is really no excuse for being unprepared. "Don't try to make me feel bad because I am blue black its 2015 go to Mac, Bobbi Brown, Makeup forever, Iman cosmetic, black opal, even Lancôme and Clinique carried them plus so much more. There's so much options our there for dark skin tones today. A good makeup artist would come prepare and do there research before coming to work because often time you know what to expect especially at a show! "Stop apologizing it's insulting and disrespectful to me and my race it doesn't help, seriously! Make an effort at least!" she wrote. "That goes for NYC, London, Milan, Paris and Cape Town plus everywhere else that have issues with black skin tones. Just because you only book a few of us doesn't mean you have the right to make us look ratchet." She concluded by saying she's fed up with the racism in the fashion industry. "I'm tired of complaining about not getting book as a black model and I'm definitely super tired of apologizing for my blackness!!!!" she said. "Fashion is art, art is never racist it should be inclusive of all not only white people, s--t we started fashion in Africa and you modernize and copy it! Why can't we be part of fashion fully and equally?" Paul isn't the first who's spoken out about racial inequality in the cut-throat world of modeling. Jourdan Dunn, who, in January, became British Vogue's first solo black cover model in 12 years, previously told The Edit that she's lost out on jobs because clients "didn't want any more black girls" and even recounted an incident in which a makeup artist refused to touch her because of her race. Five students from various secondary schools in Anambra will represent Nigeria in the 27th World Schools Debating Championship scheduled for Singapore between June 27 and July 3. The students are: Adachukwu Onyekwena (Girls Secondary School, Amaenyi, Awka), Nnamdi Udoji (Dennis Memorial Grammar School, Onitsha) and Chinemerem Oguaba (Awada Secondary School, Obosi). Other s are: Chukwuebuka Obichi (Army Day Secondary School, Onitsha) and Nneka Chigozie(Mater Ammabillis, Secondary School, Umuoji). The state’s Commissioner for Education, Prof. Kate Omenugha, told the News Agency of Nigeria (NAN) in an interview in Awka on Wednesday that the students had qualified for the world competition. She said that after coming tops in the various national debate competitions at the secondary schools level, the five students were now set to slug it out with their mates at the international level. The commissioner congratulated them for being outstanding among their peers and urged them to be good ambassadors of the state while in Singapore. Omenugha said their success was a positive manifestation of the premium Gov. Willie Obiano of Anambra placed on education, which she said had been revolutionary. She said the state government would provide all the necessary support to facilitate the students’ journey to Singapore, as well as ensure that they had a brilliant outing as she urged them to remain focused. NAN reports that the successful students included three females and two males from five secondary schools in Anambra. Afripol 's Emeka Chiakwelu credited the selection of the students to their personal hardwork and educational reforms in Anambra State: "We must give credit to these wonderful and brilliant students, but we must not forget the government of Anambra especially Governor Obiano for sustaining and taken higher the educational reforms of the former governor peter Obi." Anambra State made history again by scoring the highest percentage number recorded in the recent result released by the West African Examination Council, WAEC. The released statistics from WAEC also showed that Agbasi Praise Chinemelum, an Anambra State candidate with the Registration number of 424953GE have the best result and first position in the entire Nigeria. Anambra state success was attributed to the reforms carried out by the former Governor obi which is being enhanced and consolidated by the new Governor Obiano. As Anambra prepares to ring out the old and ring in the new administration, the stakes and challenges can’t be any higher. The State is at a precipice with a weary population that have suffered and endured so much for so long. The outgoing administration no doubt made great strides, considering where it started. However, the expectations and aspirations of the masses from their government remains a colossal illusion. There is deep resentment at what the people see as economic mismanagement of the state for many, many years. Except for the privileged or a connected few, daily life for the masses remains a series of hard struggle for survival. While the vestiges and collateral consequences of the civil war have a part to play in the situation however, after four decades, and considerable guaranteed subvention/revenue allocation from the federal government, the people feel greatly short changed. On most development metrics, the state lags behind many other States of the federation despite being endowed with all sorts of resources, tapped and untapped. But unfortunately, like most states in Nigeria, the ruling Governors are quasi despots installed by a political machine and ruling by fiat. Only on the throes of a reelection campaign or at the tail end of their reigns that some of them become very generous and benevolent despots, throwing around some goodies and pet projects on a population that hitherto had been neglected. What the State needs at this juncture is a Marshall Plan of sorts, starting from a top to bottom reassessment of the state development priorities. The baseline projects initiated by the outgoing administration should be reevaluated and those on the “critical path” be given urgent completion priority. I had a chance to spend some time with the governor elect during his brief holiday vacation in Texas and I came out more convinced that, he is a divine gift to the people of Anambra. Like the biblical King David, he was the least expected amongst his brethren, when the prophet (Governor Obi) came calling. Now, having been chosen and anointed, he is poised to get down to work and lead his people. His “Obiano 2014 My Strategic Blueprint” lays out a good roadmap akin to a Marshall Plan for the State. It contains some big and bold ideas that would transform every aspect of life in the State. Sufficient and reliable power, pliable roads frequently maintained by the public works maintenance crew, education restored as a State priority, with emphasis on science, technical, vocational and trade schools as well as teacher retraining programs, revamped health care system with more general and rural health centers, hospitals and technologically advanced diagnostic centers, better drinking water supply for most people, initiatives to boost commerce and industry, mechanized and expanded agriculture that would make Anambra one of the nation’s leading bread baskets, better public security and transportation system. Recruit and train an army of auditors, accountants, investigators and law enforcement task force to combat corruption and fraud. New structures are needed to combat a heighted and expanded level of manipulation, usurpation, fraud, graft and corruption at State, local government, town and city administrations. The new administration can show that it could be possible to run an open, transparent and accountable administration at all levels of governance. Leaders need to set the tone at the top and lead by example. Equally important is a reorientation of the masses, public attitude and discipline matters. Certain old notions and chronic anachronisms regarding ethnic nationalism or superiority need to take a back burner. As Nigeria braces as a key member of the world’s third tier potential economic powerhouses, the so called MINT nations of (Mexico, Indonesia, Nigeria and Turkey), the State needs to ready itself as a deserving destination for the anticipated rush of foreign investments into the country. A State that in the past had more university graduates and PhD’s per capita than any comparable area in black Africa, a State with a burgeoning commercial and industrial base, and a population conditioned by circumstances to be creative, individualistic and resilient. The state could easily become one of the country’s major industrial heartlands.. The incoming administration offers a breath of fresh air and a potential answer to the yearnings of the masses who are utterly fed up and disgusted with an unending life of misery as the norm for more than 99 percent of the people. It needs to demonstrate early on that it means business, but not business as usual. It cannot be seen as a throwback or recycle of the selfsame operators and unsavory characters that have dominated and wrested power from the people. While all problems cannot be solved at the same time, embarking on achievable and affordable projects such as drinking water supply project, or electric power project, or road repair and maintenance project or mandatory free primary or secondary/vocational school program or security project on a statewide basis could change the dynamics, drastically reduce joblessness, engender a feel good atmosphere and a realization that finally something meaningful and tangible is being delivered to all of the people of the State. The pervasive feel of hopelessness could become a distant memory, and the mortifying fear of being robbed in broad daylight or worse, kidnapped with impunity, would begin to dissipate. Perception of stability and anticipation of future profitable economic activities in a safe environment would attract investors, local, national and international.. By and large, the state would start to live up to its reputation as some people have dubbed it – light of the nation and home of the brave. The Nigerian-American Leadership Council, NALC has carefully reviewed its independent analysis of the just concluded Anambra Governorship elections. As a non-partisan organization, we do not join issues with candidates or base our analysis on speculative innuendoes. However, here’s our impression of this important exercise. The four main Candidates in this race; William Obiano, Christopher Ngige, Ifeanyi Ubah, and Anthony Nwoye, all respectively did their best, to pull out their supporters for this historic election. However, we have analyzed the official results of this race, from every possible angle; and we hereby opine without fear of favor, that APGA’s Obiano has carried the day. We do not see how any of the other candidates can overcome Mr. Obiano’s lead in this race. Our informed opinion is buttressed by our observers on the ground, as well as official results from the undisputed votes already cast. The possibility of any other candidates picking up extra votes in the coming supplementary elections is not likely to change APGA’s commanding lead in this election. To say that we are surprised and disappointed with Nigeria’s INEC, for not pulling off this election without hitches or drama, is an understatement. As a Council peopled by professionals in public service, law, the US Military, and others; we see many different strategic variables that INEC could have deployed to create contingency plans for what went wrong, in some areas in this election. However, we expect that the culprit(s) that caused the problem(s) in the affected areas will be prosecuted to the fullest extent of the law. A full prosecution will protect the integrity of all Nigeria’s future elections. After months of hustling, the contest to replace the two term governor of Anambra State, Mr. Peter Obi enters its final lap tomorrow with the governorship primaries of the main opposition party, PDP, while that of the ruling APGA will be on Monday. However, being Anambra State, the home of many political intrigues, tomorrow’s contest is expected to open political oddities that are bound to be exploited by Anambra’s professional politicians. chess game enters a decisive stage tomorrow with the governorship primaries in one of the three major parties in the state, the Peoples Democratic Party, PDP. The primaries of the ruling All Progressive Grand Alliance, APGA. will take place in August 26. The third major party in the state, the All Progressives Congress, APC it emerged may also have resolved to pick the former governor of the state, Dr. Chris Ngige, setting the stage for what promises to be the most keenly contested political contest in the state. The road to the primaries in the PDP and APGA was undoubtedly laced with intrigues, the kinds that are resplendent in Anambra State, a state fabled for its different sorts of political oddities. As at press time, the PDP was still embroiled in crisis emerging from the conduct of the ward congresses. The congresses conducted in some 91 wards penultimate Monday were annulled following legal and other political considerations brought to the national secretariat which ordered a rerun in the affected wards. The party is still faced with the spectre of a legal action from the Independent National Electoral Commission, INEC which chose not to observe the congresses conducted by the Prince Ken Emeakayi faction of the party recognized by the national secretariat of the party. INEC has rather chosen to recognize the Ejike Ogbuebego led faction of the party. INEC’s inclination nonetheless, Emeakayi asserts the loyalty of all 15 aspirants vying for the PDP governorship ticket. While the PDP leadership was conducting its congresses without the presence of INEC officials, the electoral umpire was supervising another primary conducted by Chief Oguebego and the supervision was done by INEC officials from its headquarters in Abuja. Political watchers are waiting to see what will happen tomorrow, especially as a Federal High Court in Port Harcourt has ruled that Oguebego remains the authentic state chairman of PDP. APGA, which is the ruling party, has also had its own fair share of crisis. The party is entering Monday’s primary election with much controversy following last weekend’s disqualification of some of the party’s most credible aspirants. Two of the most credible, Prof. Charles Soludo and the immediate past secretary to the state government, Osalaka Obaze were disqualified under still controversial circumstances. The disqualification of Soludo, some allege was upon pressure from top presidency officials who were disturbed that he could win and then go on to oppose the PDP in the 2015 presidential election. Obaze’s disqualification was based on the lack of a voter’s card. His disqualification was even more shocking given the fact that he only returned from the United States less than two years ago and had been widely tipped to be the anointed successor of Governor Peter Obi. Obaze told Vanguard that he was sure to obtain the voter’s card last Monday following the commencement of the voter’s registration exercise in the state. For the 15 aspirants in the PDP and the dozen or so in APGA, it is very unlikely that the primaries in the two parties would end their quest if they lose. According to custom, many of them are expected to jump to other parties to continue their aspiration. Those that made it after the screening are Mr. John Nwosu from Anambra South, Mrs. Uche Ekwunife and Chief Chukwuemeka Nwogbo, both from Anambra Central, while from Anambra North are Chief Willy Obiano, Chief Patrick Obianwu and Chief Paul Odenigbo. The Nnewi –born businessman could be said to be a new breed politician. He was one of those who indicated interest in the race very early and he has manifested himself through his foundation which focuses on the empowerment of the less privileged people in the society. The permutation in some quarters is that Nwosu might become a running mate if a candidate from Anambra North emerges as the flag bearer. She is an experienced politician, having contested for the position of governor in 2010 on the platform of Progressives Peoples Alliance, PPA, and though she did not win, she had a good outing. She returned to the House of Representatives after the 2010 election and was reelected to the House in 2011 on the platform of APGA where she is currently campaigning to be come governor. She has the capacity to surprise those who underrate her. He is a member of the House of Representatives from Awka North and South federal constituency. He was one of the last to enter the race and permutation is that he could be considered for deputy. He was the last to enter the race, but has become the most discussed aspirant. He is now generally tagged Governor Obi’s candidate especially coming from Fidelity Bank where the governor’s family is known to have substantial interests. His chances are also boosted by the fact that he is from Anambra North, an area Governor Obi is actively supporting to produce his successor. He was a former SSG in the state and also from the Omambala part of the state. He has been a silent operator since he joined the race and indications are that he has established tentacles in all the 326 wards of the state. One clear fact is that all government delegates and party officials will vote for either Obiano or Odenigbo during the primaries, leaving the remaining elected delegates for grabs by the highest bidder. He is from Onitsha, Anambra North. He is not known to be making so much noise, but there must be something in him that has kept him in the race. The disadvantage he has is that he is from Onitsha town, an area dreaded by politicians from other parts of the state because of the belief that the area already has a great advantage over other parts of Anambra State in terms of development. There is the fear that an Onitsha governor might take decisions that may adversely affect the fortunes of traders in the commercial town. The cleared spirants in the PDP are Senator Andy Uba, Nze Akachukwu Nwankpo, Dr. Obinna Uzor, Mr. Ugochukwu Okeke, Mr. Walter Okeke and Prince Nicholas Ukachukwu, who are all from Anambra South senatorial zone. From Anambra North are Senator Emma Anosike, Chief Tony Nwoye and Dr. Alex Obiogbolu, while from Anambra Central are Mrs. Josephine Anennih, Mr. Sylvester Okonkwo and Chief Charles Odunukwe. The former governor of Anambra State for 17 days is the Senate committee chairman of INEC and some allege that his position is influencing INEC’s handling of the present crisis in the party. With the situation of events, Uba may become the PDP candidate without much opposition. However, if the other aspirants decide to conduct a parallel primary and produce another candidate, PDP may have two candidates as it did during the Anambra South senatorial election when Uba and Prince Nicholas Ukachukwu claimed to be the party’s candidates and two of them were voted for, but one person was credited with their joint votes. If this repeats itself, PDP may win the governorship election with the connivance of INEC which will likely come out later to name one person as the candidate of the party. The former special adviser to the president on technical matters was earlier touted to be the anointed Aso Rock candidate because of his closeness with President Goodluck Jonathan. He is from Okija in Ihiala local government area of Anambra South. It is not clear if he is still enjoying that toga of being the president’s anointed aspirant, but he is making spirited effort to win the ticket. The great philanthropist from Ihiala has been eyeing the governorship of the state since 2003. He is also connected in high places and there are indications that he may accept whatever will happen on Saturday, especially if Uba is declared the winner of the primary. During the senatorial contest that produced Andy Uba, he worked very hard to ensure that his area was delivered to Senator Uba. He is also from Ihiala. He is one aspirant that has remained neutral in the face of the on-going crisis because of his belief that as a youth, the future has a lot in store for him. He has made so many inroads in all the wards in the state and other aspirants know that he is somebody to reckon with. In a recent interview, Okeke described himself as the new face of Anambra. He is a trained accountant from Nanka in Orumba North local government area. He too has enticing programmes that could help move Anambra State forward. But the problem is that with Uba and Ukachukwu who are old warhorses in the race, he has to work very hard to upstage them in the primaries. He is one of the most experienced in the race and one of the richest too. The Evangelist –turned politician has become synonymous with Anambra politics and that explains the large followership he has. It was gathered that he was the aspirant that was amassing the largest number of delegates in the local government congress, but whether that exercise would count on Saturday will be seen. The Umuleri –born politician from Omambala area of Anambra North was running mate to Professor Soludo in 2010. He is a quiet operator and he has often said that the race is not a do -or -die affair for him. But one thing is clear and that is that the governorship of Anambra cannot be won without him being part of it. The former state chairman of PDP is loved by the youths and those who have associated with him say he has a large heart. He is also one of those that made great impact in the local government congress that was conducted by the leadership of the party penultimate Tuesday. His coming from Omambala area of the state is a plus for him but with another Omambala person in the race in the person of Anosike, chances are that their delegates might be split if one did not step down for the other. He is from Onitsha in Anambra North. He is also considered to be a bridge builder in the party as he is not involved in any of the controversies. He has consistently been in touch with the grassroots and this may go for him during the primaries. If the delegates decide to stop the controversial aspirants, Obiogbolu may become the rallying point. The former minister for women affairs is from Anambra Central. The disadvantage she has is that she is married outside the state and knowing the way Anambra people view such issue, which is that a woman, once married, totally becomes the indigene of her husband’s place, Anenih may face tough challenges tomorrow. The All Progressives Grand Alliance (APGA) Governorship Appeal Panel on Saturday upheld the disqualification of the former Governor of the Central Bank of Nigeria (NBA) Prof. Charles Chukwuma Soludo, the immediate past Secretary to the Anambra State Government Oseloka Obaze and four others who were disqualified by the Screening Panel on Friday. The six persons who were disqualified by the party’s Governorship Screening Committee had appeared before the APGA governorship Screening Appeal Panel to contest their disqualification by the Panel. The panel chaired Chief Tony Ojielo after entertaining their appeals told reporters that their appeals were lacking in merit and the Committee had no other option than to affirm their disqualification. According to Ojielo “we have listened to their appeals but their appeals lack merit. The appeal panel has Ojielo as Chairman, Bala Bako, Secretary, Dr. Mic Adams 11, High Chief Ogometu Ukpenetus and Hajia Hadiza Aliyu Gogori. Specifically the APGA Screening Committee had on Friday disqualified Soludo and five other governorship aspirants on the party’s platform for the November 16th Governorship elections in Anambra State. The panel however said that seven aspirants were successful. The successful aspirants are, Hon. Chukwuemeka Emmanuel Nwogbo, Paul Odenigbo, Hon. Uche Lillian Ekwunife, Chief Willie Obiano, John Nwosu, John Okechukwu Emeka and Nwachi Patrick Obianwu. Sources at the at the panel sitting said some of the reasons given for not clearing the aspirants ranged from non-presentation voters card, lack of evidence of financial strength to execute the campaign, incomplete certificate and their insbility to submit tax clearance. One of the affected aspirants, Idigo while reacting to his non-clearance said though he was surprised at the reason given for dropping him. Idigo who spoke to our reporter, at the APGA headquarters, venue of the screening said he is going to make another presentation to the appeal panel today. He said they were informed that evidence of financial status was going to be part of the screening requirements. ” The outcome of the screening came as a surprise to me but I am going to prepare my appeal immediately and submit to the Appeal Panel,” he said. THE screening panel set up by All Progressive Grand Alliance, APGA, to screen all aspirants for November 16 governorship election in Anambra State, failed to clear former Governor of Central Bank of Nigeria, CBN, Professor Charles Chukwuma Soludo and five other contenders. Out of the 13 aspirants contesting under the party, only seven scaled through the hurdle at the conclusion of the screening exercise which took place between August 15 and 16, 2013 at the party’s national secretariat in Abuja. The successful aspirants include, Hon. Chukwuemeka Emmanuel Nwogbo, Paul Odenigbo, Hon. Uche Lillian Ekwunife, Chief Willie Obiano, Mr. John Nwosu, John Okechukwu Emeka and Nwachi Patrick Obianwu. Those who failed the screening include Emmanuel Nweke, Ogbuefi Tony Nnacheta, Chinedu F. Idigo, Dr. Chike Obidigbo, Mr. Oseloke Obaze and Professor Charles Chukwuemeka Soludo. Chairman of the Gubernatorial Screening Panel, Alhaji Tayo Sowunmi said the reason (s) for the non-clearance of the unsuccessful aspirants are as contained in the provisional certificates issued to them. Other members of the panel were Ifeanyi Mbaeri and Chief Onwuka Ukwa who served in the panel as Secretary and member, respectively. 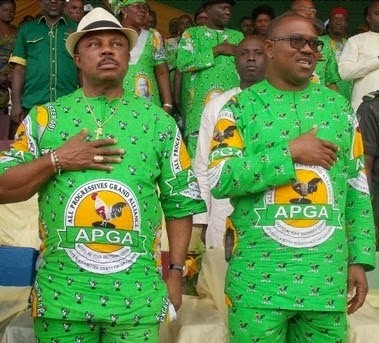 It would be recalled that the National Chairman of All Progressive Grand Alliance, APGA, Chief Victor Umeh while setting up the three-man screening panel, assured that the party has laid down a transparent process that would produce a worthy and an acceptable candidate for the November 16 governorship election in Anambra state. Professor Charles Soludo shortly after facing the screening panel Thursday in Abuja, had told journalists that he joined the APGA not because of the governorship contest but to build the party. According to him, “I am saying my priority in joining All Progressive Grand Alliance, APGA, is to help to build APGA as a formidable political party. Running for governor is not why I joined APGA. “Did that surprise you? I have joined APGA primarily to join forces with the other compatriots, other Nigerians to build APGA as a formidable political party. An APGA that will some day mainstream what APGA stands for, what APGA has to offer Nigeria. “APGA is the only political party in Nigeria that talks about true federalism. No other political party aspire to bring true federalism to Nigeria. No other political party talks about revenue allocation, physical federalism that would allow each region or state to develop according to its own space. There is no other political party that talks about competition. He also said he had to quit the PDP because it was not a political party but a mere platform to grab power. Speaking to journalists in Abuja, yesterday, Prof. Soludo said that he joined PDP by accident and now had to make a choice on where to pitch his political tent. His words, “recently I resigned my membership from PDP and joined APGA. The basic question people kept asking is why? That is a short question to ask but with a long answer. “I joined PDP by accident . I did not belong to any political party before I was appointed as the president’s chief Economic Adviser and CEO of National Planning Commission which is more like a minister of National planning Commission. “It was a political appointment and has some kind of requirement, if you like. Though it is not explicitly demanded of you so I joined the PDP without even knowing what the party stood for.. “Having stayed there for a while, I have now had a chance to review the political parties in Nigeria and have reviewed their constitutions and manifestos and also review the operations of the various political parties and I think this is now the time to make the decision of the political party that I should belong to out of choice, out of volition. It is now time to make a choice based on one’s conviction rather than convenience. “PDP started off as an amalgamation of diverse groups and individuals who really had nothing in common- probably to ease off the military but since then it has been grappling to find a bearing as political party. “As it is today, in my considered view, it is not a political party in the true sense of a political party. Why did I say that the PDP is not a political party?. I just describe it as a platform to grab power. Asked if the change of party was not to actualize his dream of governing Anambra through an arrangement with incumbent Gov Peter Obi, the economist- turned politician said that even though he was aspiring to contest on the platform of APGA, he would remain in the party if he fails to secure the ticked at the primaries. “My decision to join APGA is not just limited to my aspiration to govern Anambra State. In as much as I would like to fly the APGA flag, even if I am not given the ticket, I will still remain in APGA and support whoever emerges. This is the party in which ideology, the constitution, manisfesto, aims and objectives are in line with my views and what I believe in.